Here we are near the end of January experiencing the coldest air in nearly 20 years. Chicago will spend nearly 60 hours below zero; Minneapolis 100 hours. How is this important to the topic of ‘accountability’? I have no idea, unless you are planning to hold the weatherman accountable for the weather. Good luck. The genesis for this month’s topic comes from being with my grandchildren (4 and 2), and from time to time attempting to hold them accountable for their actions. It can be a little like herding cats, but there is a persistence and patience that comes with that guidance. Once in a while I’m successful. The process of that interaction has me reflecting on accountability – accountability of our leaders, of ourselves, of others. So, I’ve chosen to explore this topic to see where it leads us. A few of you reached out that you liked my entry on “How Will You Show Up In 2019.” Thank you. Your encouragement and feedback is much appreciated. 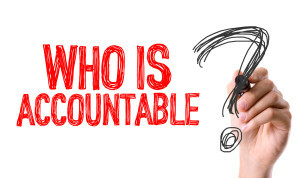 The Workplace Accountability Study in 2015 revealed that 82% of respondents have no ability to hold others accountable, but 91% of people rank accountability as one of the top development needs they’d like to see in their organization. Interesting dilemma. Employees want to keep their peers accountable when they fail to meet up to the demands of their job, in the same way they want to recognize them when they do good work. But when employees have no system of accountability in place, things can very quickly fall apart. This is why accountability matters. There is a similar dynamic in our families. When there are multiple children, each child is wanting the other(s) to be held to the same standard of responsibility that they are, including being recognized for good work. Likewise, we want the adults to hold themselves accountable for their responsibilities. So where does accountability start? Like many things, with our childhood. We learn at a very young age to be self-accountable, self-responsible – or we don’t. It was a long time before I understood that I had a front row seat in the evolution of accountability/responsibility in my older brother and me. At about 12 years of age my mother said to me that my brother didn’t have the same skills as I did to deal with life. I had no idea what that meant, but I watched my mother run interference for my brother at school when he didn’t turn in homework, when he did poorly on a test, or didn’t show up for class. I was witnessing ‘enabling’ long before I understood what it was. I also understand when you have a child that you perceive isn’t fully ‘functional’ there is a strong pull to ‘help’ them. Sometimes a little ‘priming of the pump’ (adult assistance with something that is the child’s responsibility) is enough for a child to ‘get it’ and become more self-accountable and self-responsible. The irony is that in the situations where the child doesn’t get it the ‘enabling’ behavior can become ‘dis-abling’ for the child. I’ve had two other significant family life experiences with my daughter and step-son that imprinted in me the value of accountability. I also had to go on my own journey of learning to hold myself and others accountable. It was one of the most important journeys of my life and my leadership. Fast forward back to the adult world. If we look at the accountability in our political world, you sometimes hear the phrase, “Mistakes were made” when responding to certain difficult situations. When I hear this it seems to speak to a general lack of accountability in the system. Is the person uttering it to cover their own misdeeds, or are they part of a system that has no way of holding anyone responsible for their actions? It seems that there is acknowledgement of problems only after they’ve been discovered, that often, no one is held responsible and the politicians try to move on from those problems without anyone having learned anything. In business, when employees (and managers) don’t hold themselves responsible for their actions, it prevents anyone from learning from those mistakes. This ends up perpetuating those problems until someone comes along and points the problems out. It doesn’t take much for this type of activity to create a culture of distrust. In a survey conducted by the American Management Association, 11% of managers surveyed believe 50% of their employees avoid taking responsibility. Do half of employees really shrug off their responsibility? It doesn’t matter; what matters is that those managers believe they do, and that’s the distrust that builds over time and gets worse. Many believe that this is a work culture problem. I believe the root cause is a cultural problem of our society. People come to work not being self-responsible or self-accountable. Until we individually learn those important attributes, we can’t expect the workplace to suddenly be a place where the culture will reflect accountability. Our dilemma is whether we wish to attack the more systemic problem of accountability and deal with it in our families, schools, and other institutions, or do we wait and deal with it when the adults hit the workplace? I believe we need to do both. As business leaders, we must deal with the lack of self-responsibility because that is the reality; not everyone shows up for work ‘fully formed.’ When low accountability exists in our work culture there is distrust. Distrust leads to low morale that leads to worker devaluation, leading to lower engagement and low productivity. We also know that when people do not become self-responsible lives are ruined, families shattered. Are there simple solutions? My observation is ‘no,’ until or unless we can overcome our tendency to do what is convenient for us, rather than what may be required for our children in a given situation.